A Chinese tale tells of some men sent to harm a young girl who, upon seeing her beauty, become her protectors rather than her violators. That’s how I felt seeing the Earth for the first time. "I could not help but love and cherish her. In Notes on Nursing: What it is, and What it is Not (1860), 53. 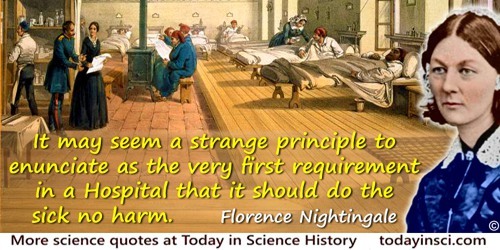 As to diseases, make a habit of two things—to help, or at least to do no harm. Epidemics, in Hippocrates, trans. W. H. S. Jones (1923), Vol. I, 165. Reflections: Mathematics and Creativity', New Yorker (1972), 47, No. 53, 39-45. In Douglas M. Campbell, John C. Higgins (eds. ), Mathematics: People, Problems, Results (1984), Vol. 2, 3. 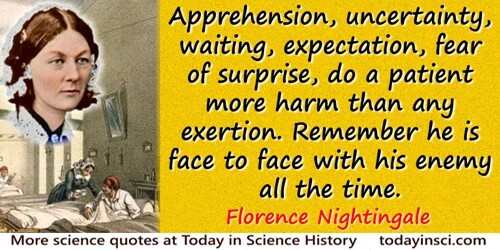 Science in the service of humanity is technology, but lack of wisdom may make the service harmful. Epigraph in Isaac Asimov’s Book of Science and Nature Quotations (1988), 321. 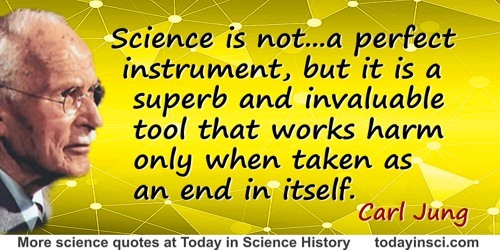 Science is not ... a perfect instrument, but it is a superb and invaluable tool that works harm only when taken as an end in itself.